Many sailors are familiar with the term schooner and it is immediately associated with the classic schooner's fitting out but what are the origins of this word? Talking about the Borkumriff IV means that all the various hypotheses regarding the origins of the word schooner must be examined. Some maintain that it is a term that was invented in the United States, others that it is a word used for the first time in Scotland, some say in England and yet others in Denmark or in Holland. 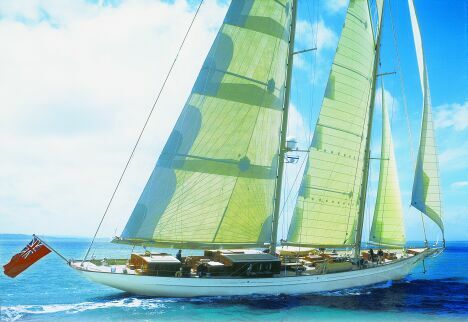 Of the many hypotheses and claims, the origin of the word schooner that probably best fits the Brokumriff IV is that claiming to derive from the Dutch adjective schoon, with the feminine version schoone meaning trim, proud, elegant, beautiful and graceful. This meaning of the term schooner would seem to best describe the Borkumriff IV, hence the reason why it cannot be overlooked in an introduction to this splendid boat. 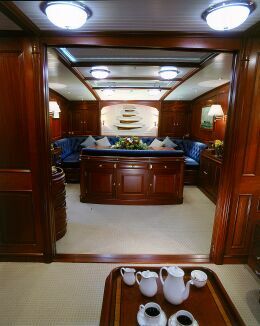 Realised in the Royal Huisman Shipyard in Holland, it was designed by the boat architects Gerard Dijkstra and John G. Alden, based on the classic lines used for schooners from the Eastern American coast. Standing in front of the Borkumriff IV is a bit like admiring a work of art, where each detail, in its whole, is the result of creativity and mastery of the technique. She looks like a radiant old lady of the sea, but appearances really deceive and here they hide modern technological content and avant-garde construction solutions, which have been translated into simplicity of control of the wide spread of canvas and in safety standards that previously were unthinkable. She is fitted out with a flying jib, a jib and a small boom forestay sail, a Marconi sail with gaff topsail and a large radial mainsail on the main mast, totalling 1,164 square meters of canvas when sailing. The two masts are in aluminium and are completely tapered, the main mast measures 47.31 m while the bow mast is almost 40 m; the three booms are in carbon. Allrunning rigging is controlled from the cockpit, in order to make piloting the boat easy and to reduce the number of crew. 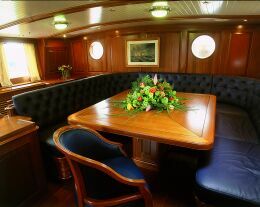 The Borkumriff IV, despite the choice of materials aimed at keeping down her weight and at technical solutions belonging to "racier" boats, has an exquisitely retro fascination both on deck and in her cosy, refined interiors. Below deck there are no less than three saloons, of which one is dedicated to the crew in the zone astern of the sailors' cabins in the bow, one amidships with an adjacent dining area and, finally, one in the bridge house in the centre of the boat, astern of which there is the cockpit with the control station and a second bridge house reserved for the crew's daily activity. 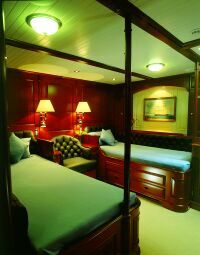 The sleeping area includes two spacious double guest cabins, with twin beds, the owner's suite with its own office taking up the whole width of the boat astern in the main zone and the seven cabins for the crew. Naturally this layout is the one chosen by the owner during the design stage, but the enormous amount of space on hand offers innumerable possibilities. The engines include an MTU 1,072 HP diesel engine, coupled to a ZF BW 255 reducer. 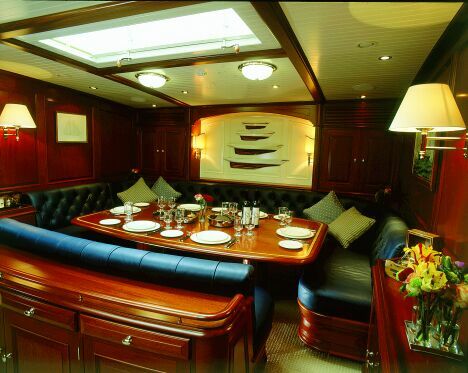 According to the yard's indications, the Borkumriff IV has a maximum speed under sail of about 15 knots. The two tenders provided on deck are a 4.5 m. RIB and a pilot boat made to the design of a 1935 launch developed by G. Alden of Boston. 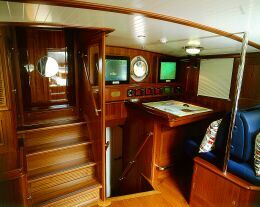 As befits an important boat, the Borkumriff IV also has a starboard gangway. This in consideration of the fact that given the height of the freeboard and the height of the stern above the water, there is no other alternative for boarding and leaving the boat at anchorage. 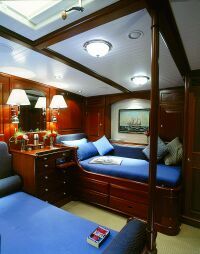 The safety equipment on board the Borkumriff IV is on the same level as the potentiality of this beautiful pleasure craft: three independent fire fighting systems, an integrated computerised control system of all the apparatus and machinery on board, smoke detectors and a general alarm system for main system malfunction. 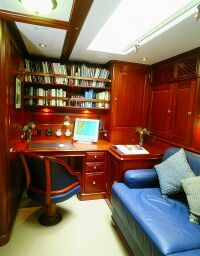 Naturally the communications system is also in proportion with the rest, in fact, from the satellite apparatus that also offers Internet connection, to the VHF and SSB radio systems, to the map-making GPS and the integrated navigation system there really is everything you could possible want for casting off and taking to the high seas.